Ed Ruscha’s complex vision of the Western American landscape unfolds at the de Young Museum. 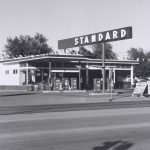 Standard Station, Amarillo, Texas, 1962, gelatin silver print, image and sheet 5 x 5 in. (12.5 x 12.9 cm). Ed Ruscha, Asphalt Jungle, 1991, acrylic on canvas, 82 x 104 in. (208.3 x 264.2 cm). In John Ford’s 1956 masterpiece The Searchers, the wide frame is utilized to create one of the movies’ most iconic images of existential American individualism in the West: John Wayne silhouetted in a doorway, beyond him the plains, mountains, and sky. In essence, Ford gives us the concrete and the limitless. This meeting of sleek, tightly controlled modern design and expansive poetic landscape echoes loudly in the work of Ed Ruscha, an artist who has also chronicled of the American West, its realities, its fictions, and the place he inhabits at the crossroads where they meet. 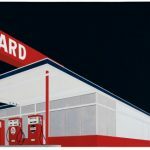 The de Young Museum in San Francisco presents Ruscha’s work with a focus on its connection to our national mythology in “Ed Ruscha and the Great American West” (July 16–October 9). The exhibition brings together 99 works and details the artist’s enduring engagement with landscape and the iconography of the West (both existing icons and his own) through multiple mediums and perspectives. 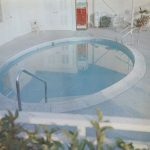 The show is divided into nine sections organized according to periods of Ruscha’s career and themes found throughout it. Through these sections Ruscha’s desire to explore the West from every possible perspective becomes evident—from high above (Fashion Square, Sherman Oaks, 2000) to slightly below; from the ghostly past (Bison Study #2, 1989) to the stark present (Filthy McNasty’s, 1976); from behind the Hollywood sign (The Back of Hollywood, 1977) to the fine print (The End, 1991). Ruscha made his way across the desert from Oklahoma to Los Angeles in 1956, at the age of 18. Along the way, traveling the legendary Route 66, he fell in love with (or at least became fascinated by) the landscape of the Western United States—lonely modern gas stations, distant orange horizons, advertising signage, endless highways, and the time to ponder it all. 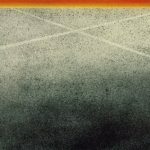 What Ruscha discovered in his travels was a meeting of new and old America, the counterculture yearnings of Jack Kerouac’s On the Road meeting the opportunistic and freedom-seeking ideals of westward-bound pioneers. Ruscha combined these dovetailing sentiments with a strong graphic sensibility (he worked for the Carson-Roberts Advertising Agency in Los Angeles as layout artist) and found a way to amplify the stark abstraction inherent in the desert landscape and the human perspective at the center of it all. The history of Ruscha’s color screen print Standard Station (1966) traces the personal, technical journey of the artist through mediums and ideas. It was developed from his 1962 photograph Standard Station, Amarillo, Texas, and the casual documentary framing of the photograph is transformed into a colorful pop vision in the 1962 colored-pencil sketch Standard Study, leading to the iconic, graphically intense 1963 oil painting Standard Station, Amarillo, Texas. Three years later Ruscha arrives at the softer, yet still intense, desert glow of the 1966 screen print. The compositions of both the 1963 and 1966 versions are low-angle, evoking the idea of approach, the clean modern oasis rising up from the unforgiving smoothness of the desert through a car windshield. The windshield is the linchpin of the new subjectivity at the heart of Ruscha’s work. By allowing it to be the vantage point, Ruscha acknowledges one of America’s most commonplace symbols of personal freedom—the car. This perspective is uncompromisingly realistic and honest in its approach, dispensing with the Romantic, level, privileged view of the world in traditional landscape and substituting a contingent, partial view framed by the car window which seems to say: Let’s be honest, this is how we really experience America. The new post-Romantic view of the West was a rich theme for works of art of the 1960s counterculture. 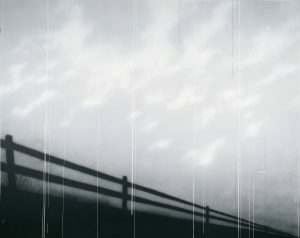 In films such as Dennis Hopper’s Easy Rider and Monte Hellman’s Two Lane Blacktop, the stark blank canvas of the desert became the open space for existential wondering and wandering and the search for “America.” In Ruscha’s work an ironic assortment of pop images becomes the stuff of personal psychology and fantasy—billboards are grafted onto our field of vision and long highway drives are journeys into the mind. During the ’80s, words begins to redefine subjectivity in Ruscha’s work; the human perspective no longer means simply vantage point but also thought and its constant presence. 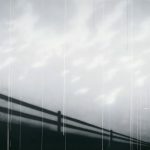 A Particular Kind of Heaven (1983) depicts a surrealistic desert horizon with the title phrase overlaid, floating in the sky, the moment of thinking captured. The mind and the landscape become intermingled. Words appear on top of mountains, pristine icons (the Hollywood sign, for example) crumble, and feelings take form in psychologically charged personal visions. Ruscha’s work shifts between bringing out the essence of design in the commercial and commonplace ( as in Standard Station) and documenting the mundane and tacky with smirking detachment (Ed Ruscha and some Los Angeles Apartments, The Sunset Strip). Finding a meeting point between his artist’s books and his painting can be tricky, but the common theme is the West, the reality it presents and the dream—in a sense, still Romantic—it symbolizes. In Ruscha’s work there is a journey across the desert to “The End” of the line in Los Angeles, and it’s a grim place to arrive. Ruscha’s take on it echoes those of many of his disillusioned contemporaries. The cheap, desperate facades and apartments of Los Angeles makes one wonder if going back out into the desert, the true place of dreams, might not be the best, most humane decision.